The online designation of up to three charities is an easy and very rewarding experience with something meaningful for everyone. This also makes a wonderful gift because the gift-recipient gets to give the funds to the causes that are close to their heart. Follow the easy instructions on the back of the card to donate the funds. Learn about the charities at our website. 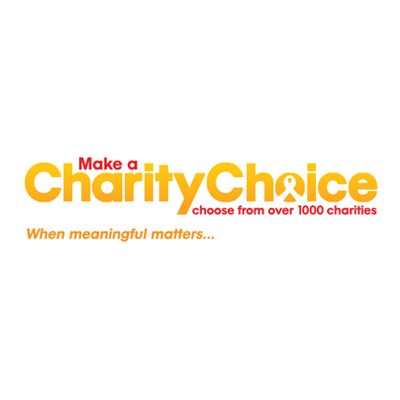 Follow links to the various charities’ individual websites for more information to assist in making your decision. For more information and a complete list of the charities available for selection, visit www.charitygiftcertificates.org. Not redeemable for cash or merchandise. Never expires. CharityChoice Gift Cards is a project of Special Kids Fund (501c3, EIN 58-2550249). Special Kids Fund allocates funds to the selected charities, quarterly. Funds are distributed to each of the designated charities in one payment, as a bulk allocation. Keep confirmation of your charity designation and verification of your order from your rewards program for your records. Ask your tax advisor as to your eligibility for a tax deduction.